Custom Cufflinks to make the perfect gift for any man! 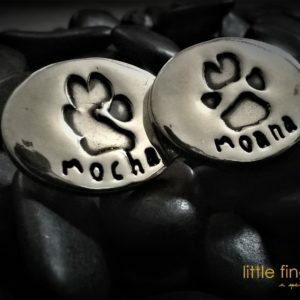 Using your Cat’s or Dog’s pawprints, our Paw Print Cufflinks can be worn every day or given as a stunning keepsake. the cufflinks can even be given to commemorate a special memory or date. Your pet’s unique paw prints are pressed into pure silver. Taking prints is made easy and mess free with our free printing kits, included with every order.